Recently we participated in a workshop on Team-Based Learning (TBL) at Brooklyn College, a process where your students are divided into permanent teams for the entire semester. The teams work during class on activities based on readings. You can read more about it in a short article in The Chronicle of Higher Education. Also take a look at the TBL website www.teambasedlearning.org. Similar to the ‘Flipped Classroom’ students do the reading (yes! they actually do it) BEFORE the subject is taught in class and are quizzed on that material before each unit of study (typically 4-7 units a semester). Classroom time, then, is spent on active learning activities in teams that are meant to promote deeper learning than a typical lecture. Team-based learning was developed by professors working with Business and Marketing majors with large lecture classes. While we were both attracted to the idea that students reportedly read and engage more, we wondered ‘Can this be applied to an Art History class?’ Beginning in the Fall 2013 we began to experiment teaching our classes using this method, fully implementing it this semester. The conversation that follows is our take on using TBL in an art history class. Jenn: I have used TBL in two upper-level art history classes – Foundations of Islamic Art and Romanesque Art and in general it has been a positive experience! But the way it was taught in the workshops needs some tweaking for art history. Perhaps a good place for us to start is on what works well in TBL. Lauren: I have used TBL in two courses – a one semester, global survey (50 students) and an upper level Mesoamerican Art course (25 students). Overall, I think students enjoyed the experience, even if some students expressed their concern of working in teams. Personally, I found it rewarding and challenging, particularly because of the unique nature of teaching Art History. So, yes, let’s focus on what works well. Jenn: The teams work on what are called “Application Activities” in TBL jargon. My most successful one so far has been on monasteries, and it took three class periods. Students had 6 primary source readings to do in advance. Each reading was about the monastic life, for example we read Benedict and Peter the Venerable. They also had to do a reading on monasteries, learning to identify three monasteries: Cluny, Fontenay, and Monte Cassino. Students had to fill out a grid on the reading asking them to list the ideal behaviors and ideal environments that each writer espoused. In class, the teams then created one grid, discussing the readings and fleshing out what they had done on their own. Following that, each team had to glean the three biggest problems facing abbotts in the Middle Ages and post them for the whole class. We had a great discussion! Students were able to say so much about other team’s lists because they knew the material so well at this point. During the second class, they were asked to create their own ideal monastery with a drawn plan, a page on what was included and why, and a list of 10 rules for their monks. It was so exciting listening to their conversations. I heard one woman arguing why her group needed to include a chapter house for their monastery. Another group ran a hostel for pilgrims and carefully designed their monastery to separate the laity from the monks, without having seen a medieval example of this. During the final class, each team hung up their beautifully drawn monasteries and rules. Teams were then asked to go around and evaluate the other teams’ monasteries. With post-its, they wrote questions on the other projects and put a star on their favorite monastery. The class ended with a really in-depth discussion and they got so much more out of it than they would have, had I simply lectured on monasteries. Lauren: One of my successful application activities for my art-history survey focused on the subject of power and patronage. Prior to class, students read four Smarthistory entries about patronage, an Ashokan pillar, the Merode Altarpiece, and Bernini’s St. Teresa in Ecstasy. I asked students to complete a chart that helped them list important points from the reading and organize their ideas. In class, I delivered a mini-lecture about patronage in general. In teams, they engaged in 5-10 minute activities that asked them why patronage is important for studying the history of art. For the remainder of class and for most of the following one, teams created a poster that addressed the following: “Which of the objects best endorses the political ambitions, social position, or prestige of the patron(s)? State your specific choice and explain why you selected it in 1-2 sentences. 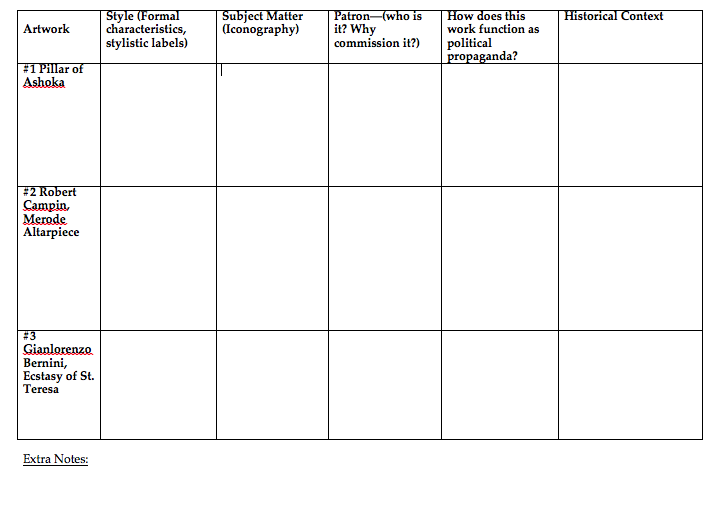 Then, provide and discuss at least 5 pieces of evidence (stylistic, iconographic, contextual, etc.) to support your claim.” After each team completed their poster, they taped it to a wall to engage in a gallery walk (more TBL jargon). All teams had to decide which team produced the best claim and evidence, and which team did not defend their claim sufficiently. They used a green and red post-it (with their team name and a comment) to designate the “best” and “needs improvement.” They couldn’t vote for themselves. The results were wonderful. As I walked around the room, students asked me questions about the readings or specific follow-up questions about the artworks. One team exclaimed that the chart was so useful because they could organize their ideas before discussing them as a team. Another team mentioned that choosing one object was challenging, specifically because all three offered excellent case studies. Listening to their discussion as they narrowed it to one object was exciting, as well as insightful. I was able to see them working as art historians, rather than listen to me give them information. Once each team finished their posters and commented on other teams’ end products, we engaged in a class-wide discussion about those posters that received green or red post-its. This allowed us to discuss as a group how to make an effective claim and support it. One team even decided to rate themselves as the least effective; they noted that in the process of reading other teams’ posters they realized their claim was too general and their evidence vague. This same team mentioned to the class the steps they would take to develop a better argument. It was wonderful to see members of other teams realize how they could improve their own poster (several students even jumped up to mark additional data on posters). Three teams presented excellent posters, and we discussed why these examples were most effective. If we skip ahead to the midterm, students used this application activity as a model for writing effective comparative essays. The midterm essays were the best I’ve ever received in a survey class. For my upper division art history class, I had a wonderful team activity focused on the Postclassic international style and symbol set (PISSS) in Mesoamerica. Students read a short article prior to class that discussed what the style and symbol set entailed. Near the beginning of class, I asked students to decide which of the following the PISSS related to most: hipsters, traffic signs, cartoons, videogames, or corporate branding (e.g., Coca-Cola). I initially thought this discussion would be brief, but as I walked around the room I overheard the most exciting discussions about the topic and so extended it to 30-minutes. Each team then simultaneously reported using stock cards (labeled with A, B, etc.). This allowed us all to know instantly how each team responded. We then discussed the answers, and teams articulated why they felt their answer addressed the question best. One team chose hipsters and had a very creative answer that perfectly captured how the PISSS parallels aspects of the contemporary moment. And we fulfilled my dream of discussing hipsters in Art History. Lauren: One drawback of TBL is that it focuses heavily on multiple-choice questions for the quizzes (the Readiness Assurance Tests, or RATs). I have realized that I need much improvement in writing questions, as well as providing answers that are not too easy or too difficult. I also have noticed that students take longer on these quizzes than I expected. I originally gave a 20 question quiz for the first unit. I quickly realized that 20 questions took almost 2 hours because they took it individually first and then again as a team. I’ve changed these quizzes to be 10 questions, and I feel they are just as effective—if not more so. Another potential weakness of TBL is that we don’t look in as much detail at images on the screen. Jenn and I have requested iPads to use in our TBL classes because we hope that this will allow teams to look more closely at specific images in color rather than the black-and-white images in a reading or textbook. It also allows students to look at images in any order they choose rather than in a linear fashion (like Powerpoint). Jenn: Lauren, I completely agree – I need to take a workshop in multiple choice! I’m not sure I will stick with that – the first semester I gave short-answer quizzes and I think that works better for me. I would add that group dynamics are challenging at times. The teams have to evaluate each other, which counts toward their grade. Nevertheless, some people are not team players. The team tends to bring most people into the fold eventually but I’ve had a few hold outs and their grade suffers. I wonder how fairly that assesses their work. But, working in a group is a skill like any other. I’m pretty happy with TBL and want to do more, though I never thought I’d be bringing scissors, poster board and markers into my college classroom! We’re making guidebooks for pilgrims this week. Lauren: I agree; I think TBL has some amazing benefits—and I love having the lights on more often. I actually get to see my students.